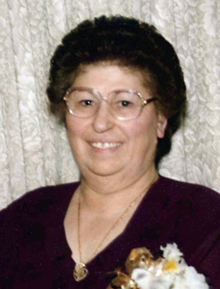 Diletta Grieco (DeSisto), of Revere, passed away on January 28th peacefully surrounded by her loving family at the age of 86. Beloved wife of over 65 years Nunzio Grieco. Devoted mother of Marisa and her husband Saverio of Lynn, Concetta "Tina" Grieco of Revere, Angelo Grieco and his wife Susan of Revere and Michael and Carmine Grieco of Revere. Dear sister of the late Carmelinda Rosato and Guiseppe DeSisto. Adored grandmother of 4 grandchildren and 6 great-grandchildren. Alsos survived by many loving nieces and nephews. Family and friends will honor Diletta's life by gathering at the Ruggiero Family Memorial Home 971 Saratoga St., East Boston on Sunday February 3rd from 1:00PM to 5:00PM and again on Monday morning at 8:30AM before leaving in funeral procession to St. Anthony's Church Revere St., Revere for a 10:00 AM funeral mass in celebration of Diletta's life. Services will conclude with Diletta being entombed at Holy Cross Cemetery.